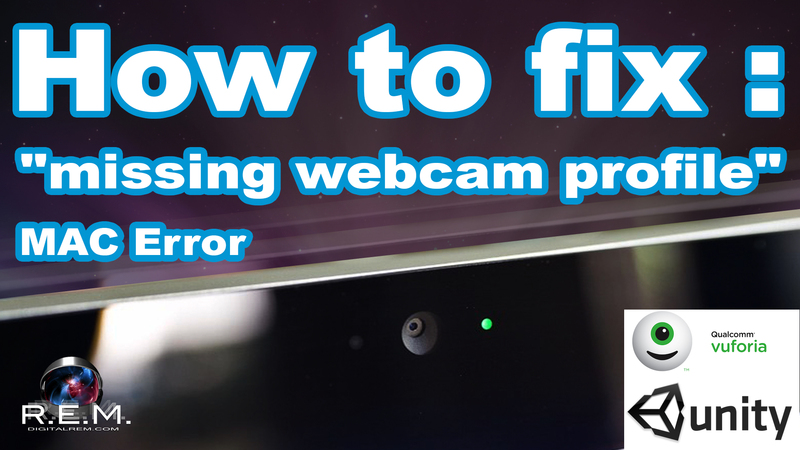 How to fix the "missing webcam profile" error in mac? I'm using Unity 2017.2.0f3 in Mac, with Vuforia 6.5.22. When I use my own webcam, the Vuforia Configuration said: "No webcam profile has been found for XXXXX". I try to fix it based on the instructions and there is no luck. 1. Some blogs said, webcam profile only works for windows 32-bit, is it still true? 2. Some blogs said, the path "Project/Assets/Editor/QCAR/WebcamProfiles/profiles.xml" is out of date. It should be "Vuforia/Editor/WebcamProfiles/profiles.xml", is it still true? Since I never succeeded, I cannot get the answer for either one. I have tried all the solutions on web (I didn't try windows since I don't have a PC). Even if I cannot solve it, I hope to get a clear answer for them. I hope a dev inside Vuforia can answer them. Nice video - you nailed the solution. Appreciate your contribution to our community. To follow-up on the web cam name issue: Why does the XML file provided by Vuforia have web cam names different from mine? This is due to how cameras identify themselves to Vuforia. The name string is baked into the device's firmware. So, if Apple decides that with the next OS release they'll change the embedded camera name from "Built-In Eyesight" to "Display Eyesight", then Vuforia will only recognize the latter. We put a few example device names in our example webcamprofiles.xml, but this doesn't represent the name your web cam uses. I made a video to resolve the issue of the this thread. Has anyone figured out a solution for this bug with the MAC IOS Built in Camera? I was getting the same error. I went into the webcamprofiles.xml and added the name suggested in the error massage. The error went away, but the camera still doesnt work. Has anyone come up with a solution? I'm working on macOS 10.13.4, unity 2018.1.6f1 personal. I don't know if you still need it but this worked for me on a pc - not on a mac, but it is worth a shot. Webcam profiles are now in your unity folder since Vuforia is built in now. Search around in Applications\Unity and you'll find it.